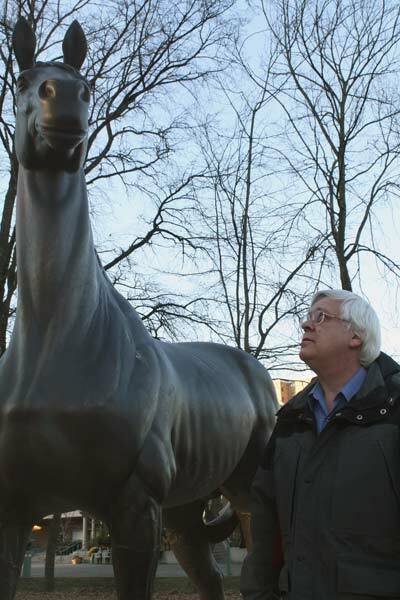 Bill Purver, archivist for the City of Richmond, examines a statue of Minoru commissioned by the city to honour the popular racehorse. An award-winning racehorse, a severed leg and a murderer are not typical inspirations for street names, unless you live in B.C. Those three items are the basis of street names in Richmond, Surrey and Vancouver, and among the weirder stories collected by the citiesâ€™ archivists. City archivists collect and record the histories of the various municipalities, and store it for later reference. Melanie Hardbattle, an archivist with the City of Vancouver, said her job offers a necessary service to those in Vancouver. â€œItâ€™s very important for people to feel a connection to the past,â€ she said. Many use the archival records to research city events, family lineage, even the history of their houses. â€œWe provide an important service to those people. If we didnâ€™t have the records, we wouldnâ€™t be able to provide that info,â€ she said. Sometimes that provided info can get a little strange. Below are the three of the wildest stories behind street names. A quick Google Maps search for â€œMinoruâ€ in Richmond gives about 500 results, covering one area of the map in little red dots. Thereâ€™s Minoru Chapel, Minoru Place Seniorâ€™s Centre, Minoru Laser Dental, not to mention the actual boulevard itself. Minoru is everywhere. â€œMost people think that Minoru is a Japanese name, and has something to do with the Japanese-Canadian community,â€ said Bill Purver, a Richmond archivist. Purver explained that many Japanese immigrants came to the Steveston area in the 1800s to seek out lives as fishermen. But the popular name has absolutely nothing to do with the Japanese-Canadian community. The boulevard et al are actually named after the thoroughbred horse Minoru, who, in 1909, was the first horse to win two classic races, the 2,000 Guineas and the Derby, while wearing a reigning monarchâ€™s colours. In August of that same year, construction on a Richmond racetrack finished. It was christened Minoru Park in honour of the record-holding horse. The racetrack was a hit, with 7,000 spectators attending the first day, according to a Richmond News feature. The track closed in 1941, but the nameâ€™s popularity had spread, leading to the many things Minoru. It was once the best horse-and-carriage road south, with an infamous claim to fame. Hallâ€™s Prairie Way, now 184th Street, may be the only British Columbia street named for a murderer. In 1845, Sam Hall and his First Nationâ€™s wife were the first to settle the southeast Surrey district. Soon after, Hall killed his wife. He later died in prison. When the next wave of settlers came they called the place Hallâ€™s Prairie, after the homicidal husband. â€œOnly a mouldering cabin and a legend remained,â€ wrote Fern Treleaven in his 1981 book Rivers, Roads and Railways. He also wrote that the children of the new settlers feared the old Hall cabin, believing it to be haunted. Since late 2007, B.C. residents have been living with a strange occurrence: severed feet washing up on shore. These feet are unidentifiable and unclaimed, but also not a new thing. This has happened once before. In 1887, local police found a knee-high boot, complete with severed leg, in the forests of False Creek. The police placed the limb outside the station, hoping someone would claim it, according to Elizabeth Walkerâ€™s Street Names of Vancouver. No one did. Stuart Cumberland, a 19th-century writer, mentions the boot in his 1887 book The Queenâ€™s Highway. The forested area is long gone, but the story lives on. In a 1976 act, the city named the False Creek location Leg-in-Boot Square. If youâ€™re looking for a perfect Christmas present, why not get something truly original: a street named after the recipient. Vancouverâ€™s street-naming committee receives about half-a-dozen letters a year from Vancouverites putting forward the names of relatives and major contributors to the city’s development. Nominations run the gamut from someoneâ€™s great grandfather to the recently deceased Jack Poole, former VANOC president. â€œWe maintain a fairly extensive list of people who have been nominated,â€ said Marg Coulson, acting city clerk and chair of the committee. When a name comes before the panel, an archivist researches it, determining the nomineeâ€™s contributions to the city. â€œWe really donâ€™t want to be too restrictive, because people make contributions in different ways,â€ said Coulson. When the merits of the name are proven, the name gets shortlisted. The list has just over 100 names on it, said Coulson. If a street is created and a name required, the committee peruses the list to see which fits best, usually someone from the related area. A recommendation is then made to city council. The need for a name is rare, as Vancouver has very little in the way of new developments. The panel usually receives only one request a year. â€œOne thing I should say is that we do not consider people who are alive,â€ said Coulson, which could create a slight set-back for those considering self-nomination. â€œWeâ€™ll have to kill you and then we can consider you,â€ she said, laughing.